Summary: Mac and Mac are twin noodleheads, meaning their heads are hollow tubes…with predictable results. In each of the three stories in this book, they experience some kind of nightmare. In the first, they decide to sleep outside to avoid having to make their beds the next morning, but scary sounds drive them back indoors. In the next episode, they have to decide how to divide Mom’s homemade apple pie. A non-noodlehead friend comes along and suggests they take a nap. The one who has the best dream will win. Of course, the two of them wake up to an empty pie plate and a full friend. 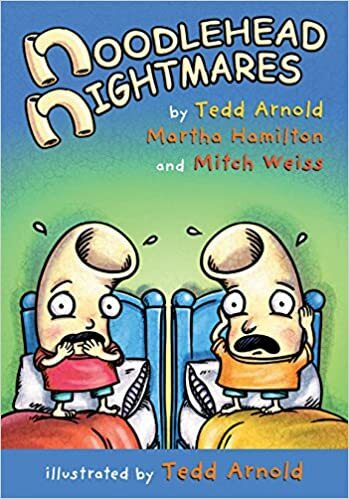 The final installments involves a lost pillow and a series of nightmares that results in the two boys sleeping under their beds…a solution that gets them out of making their beds the next morning. 48 pages; ages 4-8. Pros: The goofy story lines and Arnold’s pop-eyed comic book illustrations will have beginner readers clamoring for more noodleheads. Cons: Not the most cerebral read I’ve experienced this year.